Figure 1 - Diagram used with permission from Lipid Residue Analysis of Archaeological Pottery: An Introductory Laboratory Experiment. Copyright 2017 American Chemical Society. This activity also allowed me to interact with several colleagues at The Seven Hills School. I headed over to the visual arts department to get unglazed fired pottery that I could smash into sherds (don’t you love this technical archeological term?!). I soaked these sherds in various oils and pulled them out for drying and bagging. I spoke to the Latin teachers at school who were delighted to kick off the activity with a hands-on discussion of how archeologists now rely on analytical chemistry to provide very valuable information in their work. Of course, it really helped that both of my school’s Latin teachers did graduate work at The university of Cincinnati and have access to valuable Etruscan artifacts to bring to my classroom. Their presentation was beyond awesome! The students were actually holding items from antiquity and trying to draw conclusions through observation. This experience illustrated how limited data results in limited findings and drew the students toward the necessity for chemical analysis. The procedure found below the citation at the bottom of this post outlines the six laboratory days for accomplishing this chemical analysis. 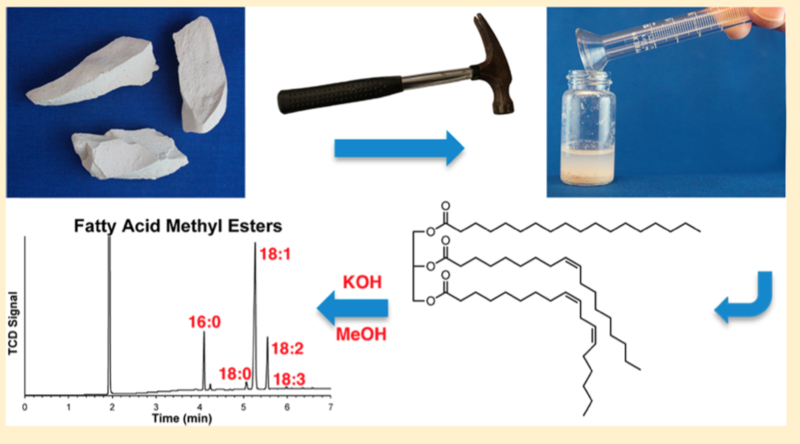 It takes the students through fatty acid extraction, methyl ester of fatty acid reaction, final sample preparation, and instrumental analysis on a sophisticated gas chromatograph. Fortunately, my students have had first-year chemistry experience with an educational model GC instrument. That means they are ready to have the more sophisticated experience provided by this activity. Finally, I know this activity is a substantial time commitment. it also requires access to a high quality gas chromatograph. If you can make the necessary arrangements, i guarantee that your students will get a very focussed experience on authentic research and data analysis. 1 - Clare S. Harper, Faith V. Macdonald, and Kevin L. Braun, Lipid Residue Analysis of Archaeological Pottery: An Introductory Laboratory Experiment in Archaeological Chemistry, Journal of Chemical Education, 2017 94 (9), 1309-1313. **Note that you can find teacher and student documents in the Supporting Information associated with the JCE article.